At least 80 people are now known to have died in a series of earthquakes in south-western China, as rescuers struggle to reach remote areas. More than 730 people were injured after the quakes hit Yunnan and Guizhou provinces on Friday, state media say. The tremors struck mostly mountainous areas, causing landslides that blocked some roads. The US Geological Survey registered the two strongest of the quakes at 5.6 magnitude. Premier Wen Jiabao is expected to arrive in the area shortly. China's Xinhua news agency quoted officials in Yunnan as saying 6,650 houses had been destroyed in the province and 430,000 others damaged. More than 100,000 people have already been evacuated, said Xinhua, and the Red Cross has sent 650 tents and 3,000 quilts to the region. The authorities have deployed the army to assist rescue teams in the rough terrain. "Roads are blocked and rescuers have to climb the mountains to reach hard-hit villages," Li Fuchun, head of Yunnan's Luozehe town, was quoted as saying. Mobile and regular phone service in the area was experiencing disruption, according to reports. 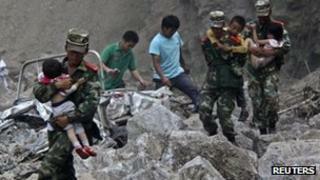 Most of the deaths were in Yunnan's Yiliang county, said officials. Television footage from state-run broadcaster CCTV showed hundreds of local residents gathering on streets littered with bricks and rocks. Users of the Twitter-like wesbite Weibo reported people rushing out of shaking office buildings, and photos posted online also showed streets strewn with rubble. Aid agencies said they were concerned about the plight of children in the two provinces following the quakes. "We are especially worried about those who may have been separated from their parents, as more aftershocks are expected to hit the area," Save the Children in China Country Director Pia MacRae said. The largest of the quakes was also felt in the neighbouring province of Sichuan, where a 7.8 magnitude quake in 2008 left tens of thousands dead.